I wanted to share a new-to-me site called Knock Off Decor. It's a DIY site that features budget friendly versions of popular store's items. 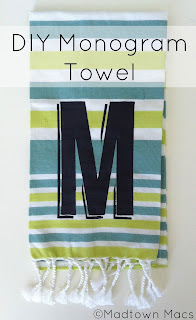 Yesterday my DIY Monogram Towel was featured. Go over, take a look, and find some other great projects too! Congrats on being featured! And thanks for sharing the site. I'm not surprised you were featured. This was a great idea with mass appeal like so many of your creations. Congrats!